Cowboys began roping as part of ranch work to brand or medicate their calves. It became a contest to see which cowboy could do it the quickest. Their goal was to throw a lasso around a calf’s head, jump off their horse, tie three of the calf’s legs together, and finish the trick as fast as possible. This led to roping contests at rodeos and fairs. Recently, a new type of roping sprang up. My first experience with this happened in a small town of about thirty people called Hachita, New Mexico. The only disturbance in this small town might be a dust devil coming down the street or a Border Patrol helicopter flying overhead. Now this kind of roping would not be done from a horse and would require a different kind of lasso. Just a heavy piece of string is used, so they don’t choke the chicken. Just like in the world of cattle, the chickens they roped all had names. The meaner the animal, the meaner its name. Names like Jalapeno Joe, Cholulu Chuy or Red Hot Flame were typical. A large crowd of over fifty people gathered to witness the chicken roping. The chicken would be let out of a box and the cowboy would be timed to see how fast he could rope it. The one who roped it the fastest won a Chicken Roping Belt Buckle with a turquoise stone found in the Little Hatchet Mountains nearby. Small towns often have fun in unusual ways. A mural of the Chicken Roping was painted by a traveling artist on the outside of the bar there. Inside on the wall were pictures of the winners. It soon became an annual event with even larger crowds. And afterward? What else, but a good old-fashioned chicken BBQ. Hachita Liquor Saloon was no longer in operation on my last trip west. The paintings on the building were done by an old friend, C.M. Scott, a cowboy artist. Appearances can be deceptive as Route 9 across the bottom of New Mexico seems to be a desolate stretch of nearly one hundred miles. But upon closer observation, the beautiful desert scenery holds many interesting experiences especially since it is just three miles to the Mexican border. This road is not as lonely as it first appears. As we leave Columbus, NM and Pancho Villa State Park, the desert is filled with low growing plants and the roadway is lined with the burnt orange blossoms of the Indian Paint Brush. You might even notice a Mexican here or there hiding behind one of the mesquite bushes. One industrious rancher added an artistic touch to this desert road. They have piled up rocks in various formations and painted them in brilliant colors to add a little interest to the lonely road. A bright yellow cross catches your eye. Listen! Overhead you hear a Border Patrol helicopter watching for illegals crossing the border. It sounds like it is getting closer. Hope they aren’t after us! This is a new and interesting landing as they are right behind us and landing in the road. Let’s keep on going but watch behind as the Border Patrol gets out and heads to the desert on foot. Something or someone close must have been spotted from above. Cows roam across the road as we travel on since this is Open Range territory. You will notice the absence of fences replaced by cattle guards. Ahead a man is standing in the road beside his truck and trailer and waving his arms. Let’s slow down and see what he needs. We can see that he is dressed casually with sandals, shorts and tee shirt and he has a long white beard and ponytail. A flat tire seems to be his problem. Since there is no cell phone service in this area, he asks if we will call 911 in the next town about forty miles away and have asssistance sent. “How about a ride?” we ask. Just then the Border Patrol appears in their SUV and as usual give needed assistance. While the illegals try to hide from them, the Border Patrol is a real safety net for those traveling the area. As we pull away, notice the lettering on the back of his trailer: All Who Wander Are Not Lost. That has always been one of my favorite sayings! Up ahead you see a small town called Hachita located between the Big Hatchet and Little Hatchet Mountain ranges. There is a gas pump here and a small store for essentials. If you want to get away from it all or hide away, this would be the perfect place! 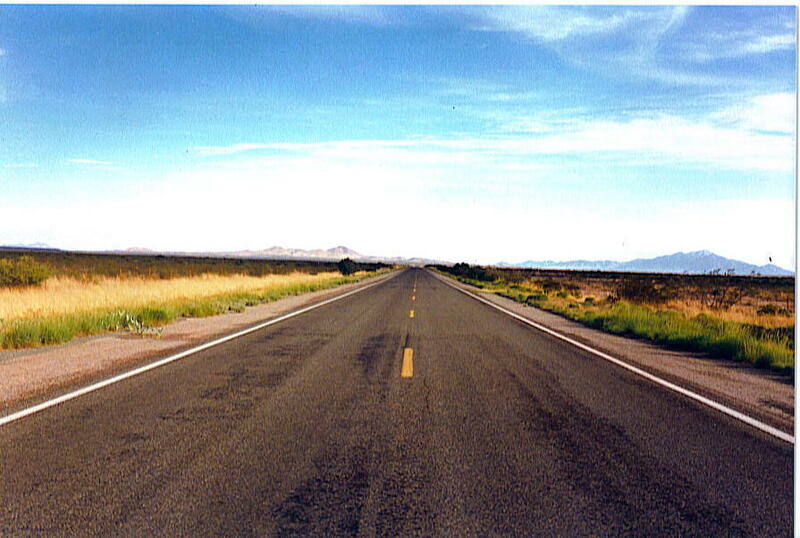 Many think this is a lonely road, but as you can see it is never boring.